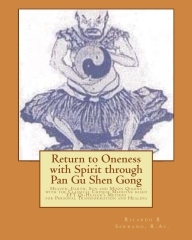 The third book Return to Oneness with Spirit through Pan Gu Shen Gong elaborates on the use of Pan Gu Shen Gong together with the EFT Qi-healer’s Method to effectively clear and release the emotional debris held in the body, cultivate the Three Treasures Jing, Qi and Shen, and strengthen one’s self-awareness through an integrated combination of Toltec wisdom, Qigong, Qi-healing, emotional freedom technique therapy, ear acupuncture, and Chinese tonic herbs. We are sick because we are not aware. Awareness is the key to healing.